I told you. These are MY dresses. Okay! I'll stop raiding your wardrobe! I, Ana Boogiewoogie, am looking for partners to expand my business so I am able to keep up with the popular demand for releases. Whether you design skins, hairs, sculpties, shoes, accessories, poses, or clothing, i’m looking for it all! Don’t think you’re good enough yet? Don’t sweat it! I am not looking for just already done talent, if I see a potential in you, I will help you learn and teach you everything I know to help you get started! For more information, please find it in Miss Ana's blog. I was tickled when two gentlemen contacted me to pose for this series on Victorian garb -- Theodore and Draco Nacht. 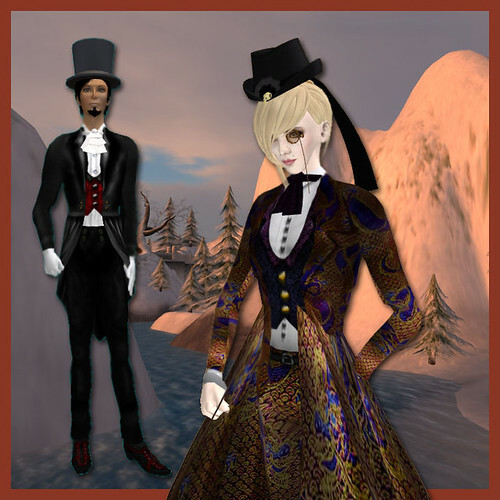 They're a bishie couple, and own the NachtMusik shop in Caledon's South End. Draco (named for the infamous Malfoy? I hope so) is wearing one of his creations, below, as is his partner Theodore. 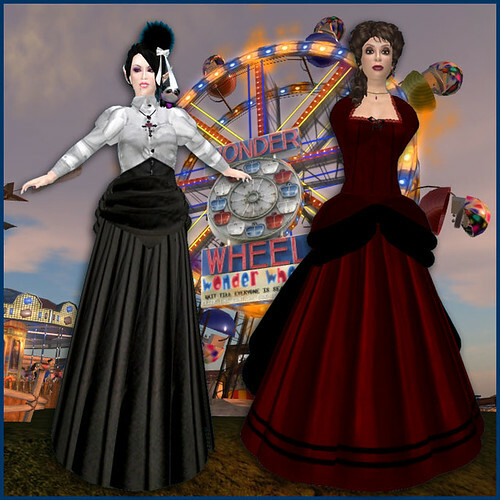 Above, the lovely Pipsqueak and Siri are in the more Victorian creations from ~silentsparrow~, two dresses that take flights of fancy from periodwear and end up in the world of lyrics and song. 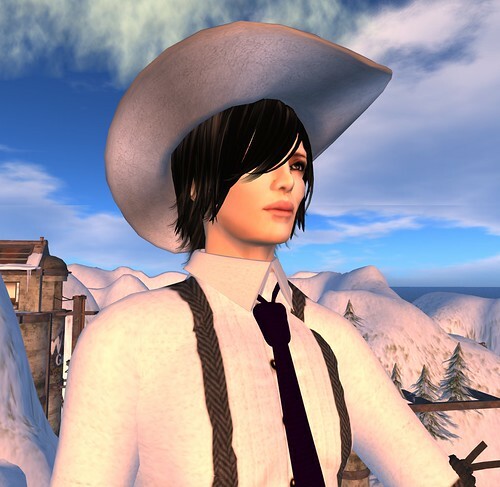 I'll be featuring more gentlemen in a day or two -- I've got to take a small break to blog for King's Rezzable (my first post about it is over here). With sheepishness I once again apologize for a lack of slurls in outfit credits. It's a case of Too Long, Must Do Something Else With Time (TL; MDSEWT?). My cat is blinking into my Second Life screen sleepily, and so am I. I spent the day teaching and studying for my big evil statistics test on Thursday, only surfacing in SL to photograph pretty Victorians (this post is a small hiatus while I scare up more) and put on this new outfit from Uncle Wiggily. The prints are FIERCE. They look like 1970s wallpaper, in shade and composition, and I approve. The hair jewelry that goes with the truth hair is from Studio Sidhe, and it was so cute that it made me go get the hair. Lucky for me there's a sale on at Truth... Right. Off to bed. 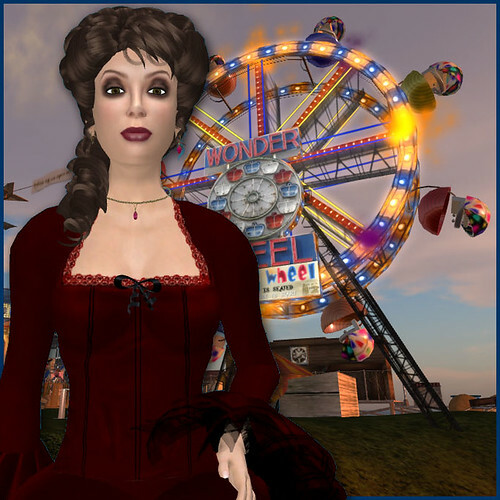 Part of the magic of Caledon, those balls, and the opportunity to dress to the nines. Also to this shoot came a few ladies in riding attire, something for the more casual day. Another memory, riding my horse around Tanglewood, and along the multi-sim stretch of railroad that has an actual running train. One of the great pleasures of Caledon is to hop aboard that train and take it from Caledon Victoria City all the way to it's terminus, many many sims away. 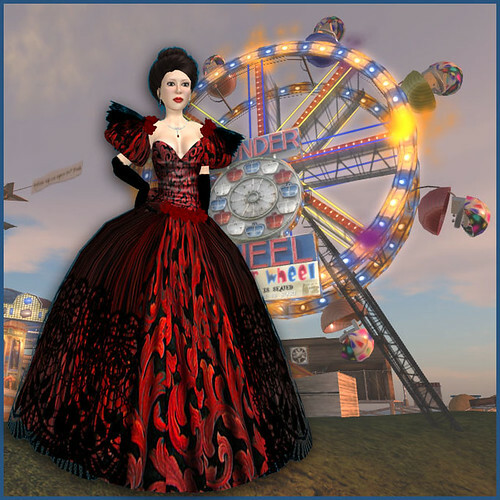 ***Outfit: M'Lady Fashions Princess Sissi. 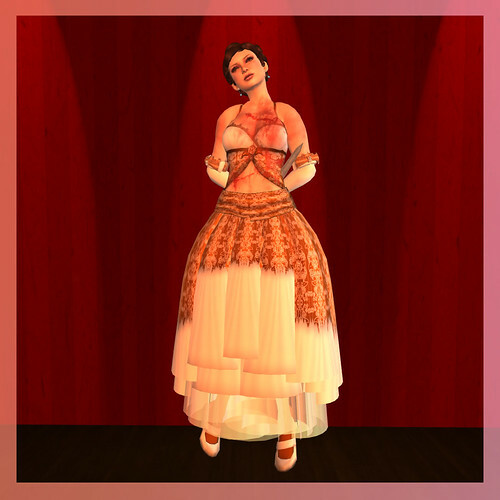 ***Outfit: Celeste from the Ivalde Couture Line. The set includes both pant and dress option. 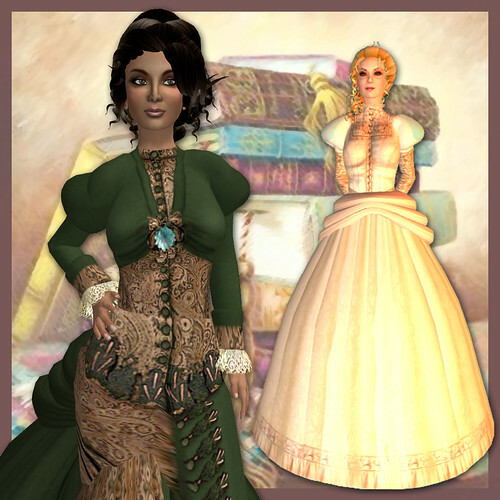 My second post about Victorian lovelies include Gabrielle Riel, Katrina Pugilist and Lola79 Heinrichs. 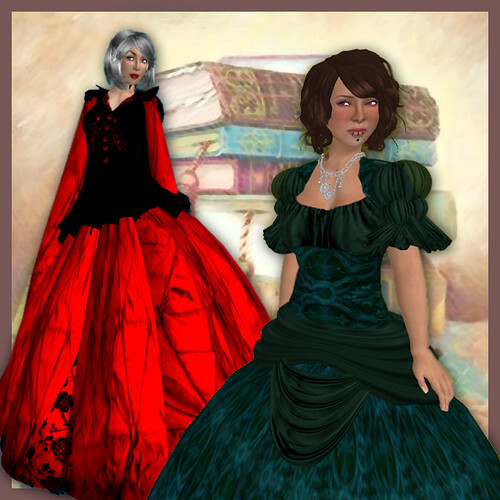 Katrina is the designer of Kat's Meow, a costume shop with a range of products, and is wearing one of her Victorian dresses. I do hope she makes more, the shape and construction are definitely lovely, with a flowing, low-necked shape straight from fantasy novels. Lola is in a Black Canary dress, bustled and high-necked. Her garb borders on the Edwardian, and she's managed to make it fey and gothic with her accoutrements. Gabrielle Riel is a preeminent Caledonians, a DJ and radio station owner, and is wearing a dress made specially for her by M'Lady Fashions (an excellent Victorian frock shop). She looks very Gibson Girl, and is, in fact, wearing Miriel's Gibson Girl hair!